When to use a crawler crane as carrier? One reason to suspend a Bottom Feed Stone Column rig from a crawler crane is the great flexibility in reaching the compaction point. Another advantage is the ability to rent a crane in nearly every corner of the world, therefore removing the need to transport special leader rigs across large distances. Paramount is the much higher production rate which is achievable in many cases. 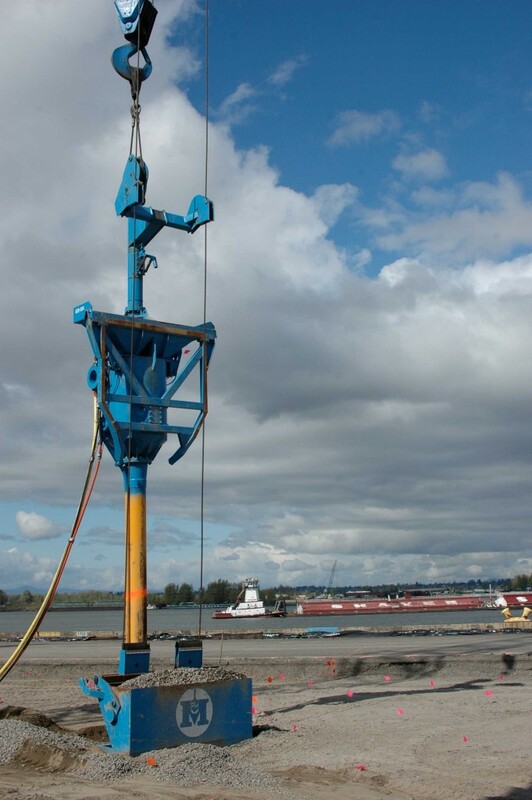 Crawler crane based rigs are not recommended for sites with very tight work spaces. The BC1 uses a 2 m3 bucket for gravel transport to the receiver hopper on top of the rig. This rig type is preferred when the gravel can be fed by a wheel loader into the tilting bucket. The bucket is either hoisted by the additional crane winch or suspended from a separate winch, attached to the unit itself. The bucket fills into a hopper on top of the rig, from where the gravel fall into a receiver tank. From the receiver tank the gravel flows through a lock/gate into silo tubes and finally reaches the tip of the vibroflot where it is released into the soil to form the stone column. The following short movie is showing the placement of one 2 m3 bucket of gravel into the BC1. The water sprays along the tubing are a special adaption on this site in Vancouver, BC . It was applied to avoid predrilling for penetration through some hard surface layers down to the layers that need treatment. 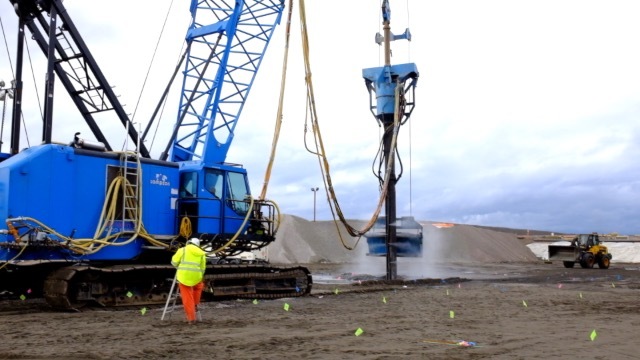 BC1 operating at a site in Portland Oregon to over 100 ft depth. There are projects for slope stabilizations where a wheel loader cannot be used to reach the gravel bucket. air from a powerful compressor is used to blow gravel through a 6-inch hose to the receiver tank of a modified BC1. This pneumatic stone transport system can use also water as transport medium in lieu of air, if the rig is used offshore. More details on Betterground’s pneumatic stone transport system is found under Custom Built Equipment.